Q. What were the key challenges of managing supply chain before you embarked on journey of implementing TOC processes? A. Liberty Retail Revolutions: We used to follow a ‘twice a year’ booking system, as directed by our plants. The retail chain had to forecast and place confirmed orders for six months at a time. Obviously, the errors were high, resulting in stock outs, surpluses and markdowns. We had stock turns of 1.5 to 2 for our retail chain. Discounting was at fourteen percent. Q. What are the key paradigm changes that were implemented while implementing the TOC processes? A. Liberty Retail Revolutions: We designed the supply chain to deal separately with continuous selling items and new introductions. For the continuous selling items, we moved away from six month confirmed booking system to pull based replenishment from a central warehouse. We also decided to sell and dispatch shoes in cut sizes and not in full size rolls. Shoes were dispatched based on consumption from stores. New products were introduced more frequently and in smaller lots. We are controlling range at nearly 60 percent of that held previously. Q. What were the implementation challenges? A. Liberty Retail Revolutions: The challenge was in shifting from booking orders to a replenishment system, and in frequent new product introduction. Buyers had to be dissuaded from ordering in large quantities, and convinced to let the system manage the replenishment on its own. The other one was to change the production mindset from expecting large ‘confirmed’ orders to delivering small lots as per consumption. Continuous handholding by Vector helped. Bajaj Electricals Limited; We embarked on the journey of implementing TOC processes along with Vector Consulting Group, to realize the full potential of all categories. Landmark (India); The rapid replenishment and replacement processes of Theory of Constraints helped us correct our portfolio in time and avoid the fate of near bankruptcy. CEO, The Mobile Store Ltd. The Mobile Store Ltd; We decreased inventory from 27 to 18 days resulting in the company achieving negative working capital. We are now a profit making company. 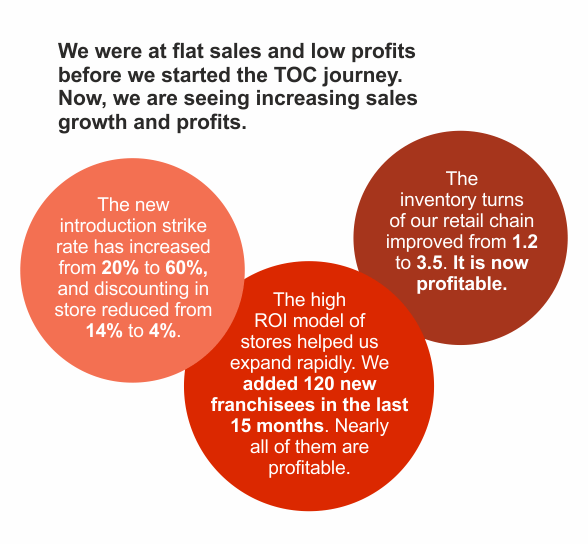 Liberty Shoes Limited; We were at flat sales and low profits before we started the TOC journey. Now, we are seeing increasing sales growth and profits. Godrej Security Solutions; With 3 times more output from the same capacity and reduced working capital requirement, we were able to improve our ROCE by three times. Managing Director Fleetguard Filters Pvt. Ltd.
Fleetguard Filters Limited’ “Fleetguard Filters is a tier 1 component supplier to key OEMs in the country, with large design, development and testing set-up”.